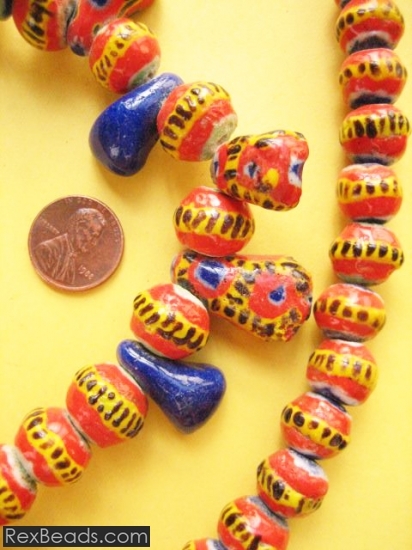 Kiffa beads are rare powder glass beads which acquired their name from Kiffa, a city in Mauritania where they were first documented by French ethnologist R. Mauny in 1949. 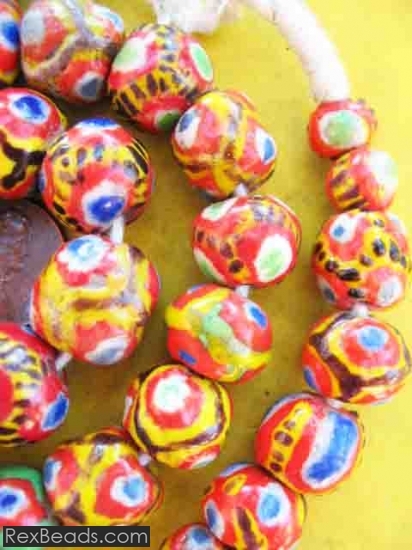 Kiffa beads represent one of the highest levels of bead making skill, artistry and ingenuity due to the fact that they were created using the simplest tools and materials available, and in open fires. These materials included pulverized European glass beads or their fragments, bottle glass, tin cans, pottery shards, steel needles and some gum Arabic. Decorations for the beads were made from the glass slurry – the crushed glass mixed with a binder and then applied using a pointed tool such as a steel needle. The beads were then placed in small containers such as sardine cans and thereafter heated to fuse them in an open fire, without the need for molds.